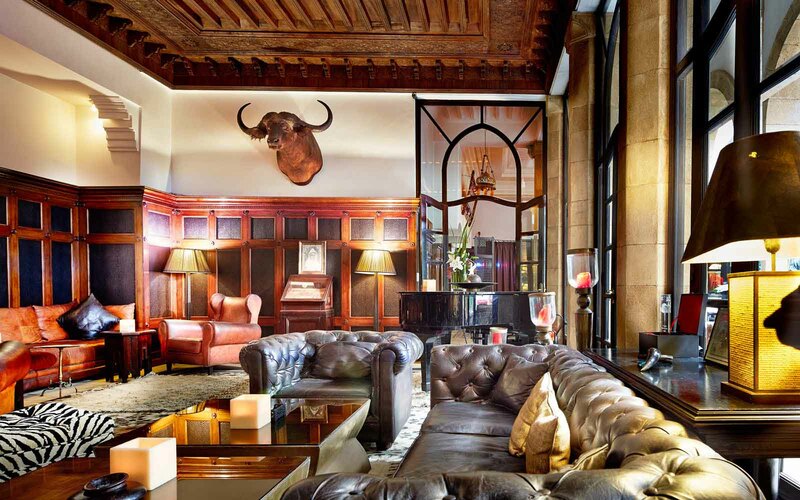 From the moment you arrive at Heure Bleue Palais you are captivated by its exquisite character. 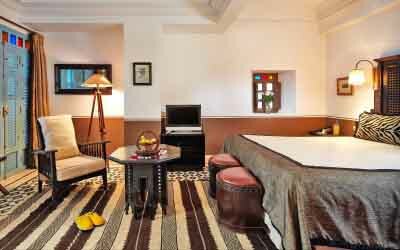 After being welcomed with disarming charm and a genuine sense of hospitality, you are shown your wonderfully crafted room, which overlooks the serene palm shaded central courtyard. 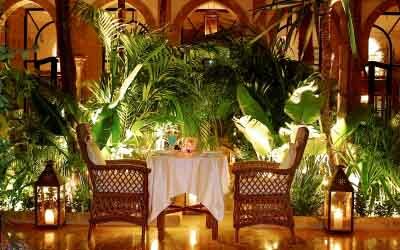 You open the window, breathe in the fresh air, and take a moment to enjoy this oasis of sublime peace and beauty. There is so much to do in Essaouira: a shopping trip to the ancient town’s fascinating souks, a visit to a museum, a 4×4 excursion to an Argan oil cooperative, or rise to the challenge of the 18-hole course at Golf Mogador… You opt for a day of discovering the UNESCO World Heritage Medina; the winding alleys, colourful souks, art galleries, handicrafts, wide sandy beaches and picturesque working fishing port are just waiting to be explored. 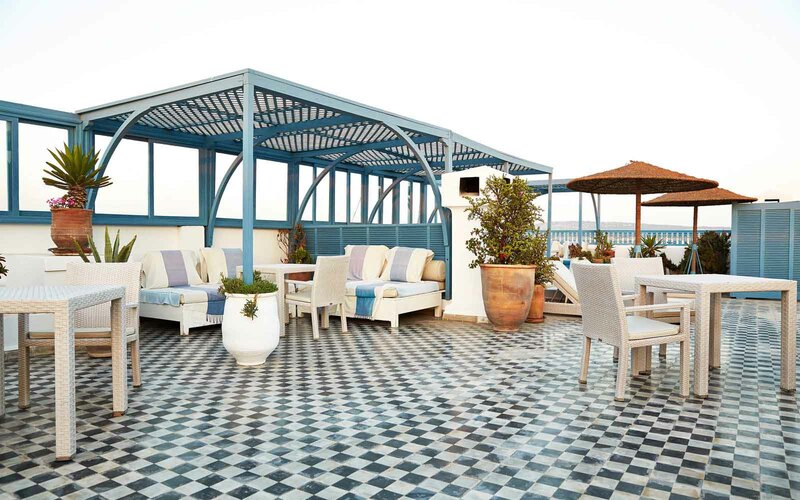 After a day in the old town you retire to the Heure Bleue Palais’ rooftop for a light lunch at the terrace grill. You enjoy the stunning views over the Medina towards the Atlantic before a dip in the heated rooftop swimming pool. 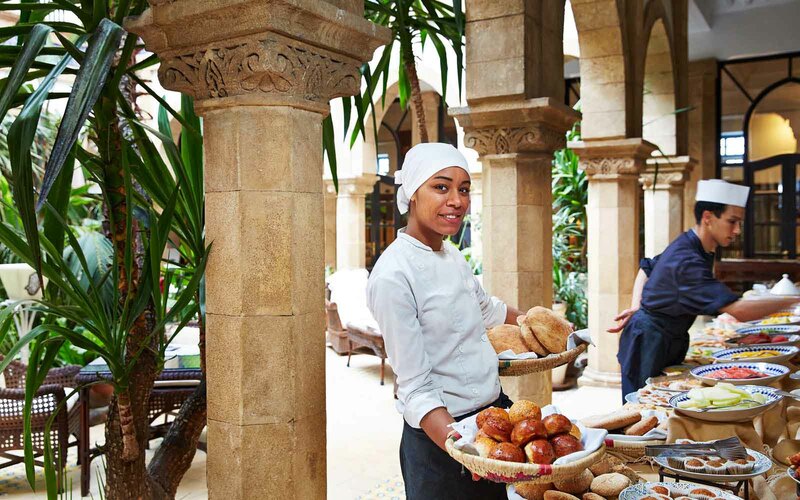 The traditional Hammam in the spa tempts and you experience an unforgettable treat for body and soul – lured away from complete relaxation only by the ‘new Moroccan cuisine’ Chef Ahmed is conjuring up in the kitchen. 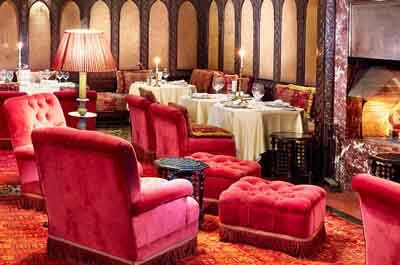 Dinner at the Salon Oriental is a delicious gastronomic journey! 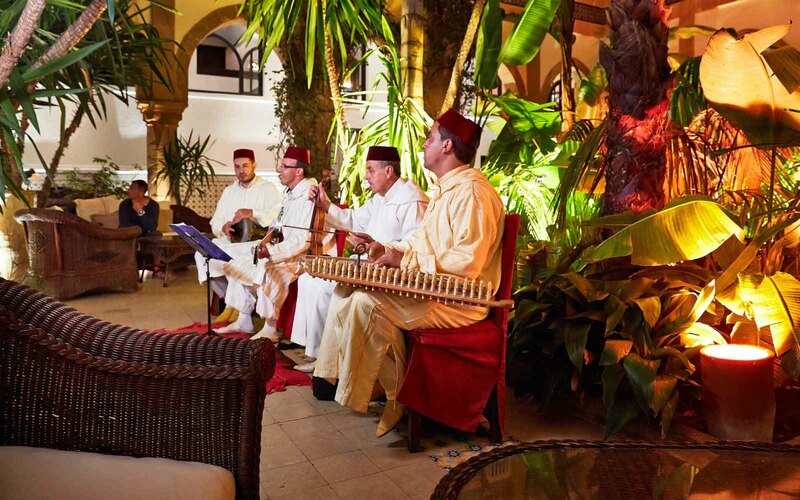 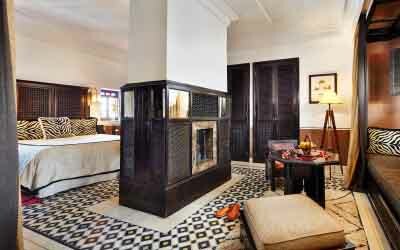 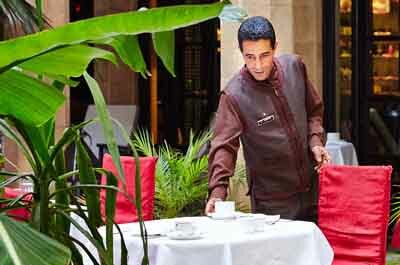 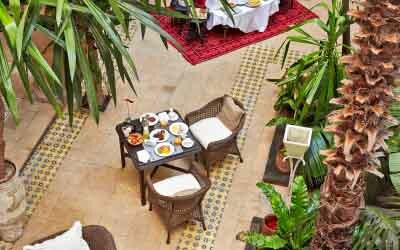 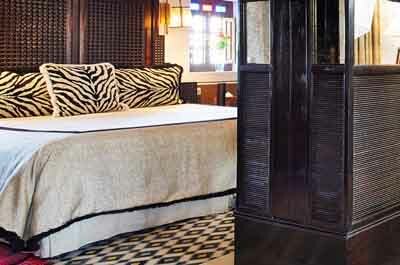 You enjoy a totally authentic Moroccan experience in luxurious comfort, matched with impeccable service. 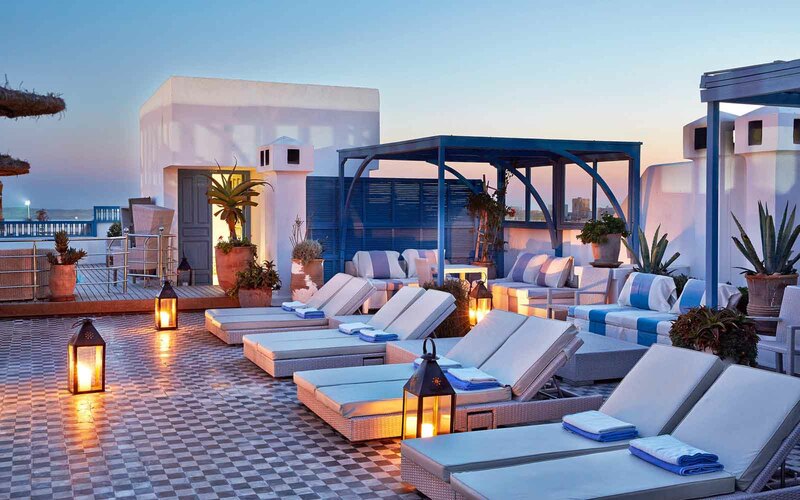 The rest of the evening is spent drinking your new favourite tipple – Heure Bleue Val d’Argan – on the terrace with friends and revelling in the beauty of the town. 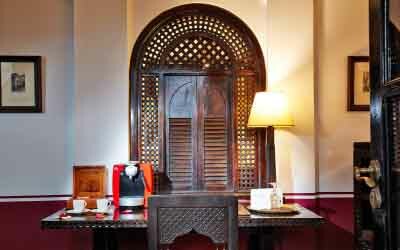 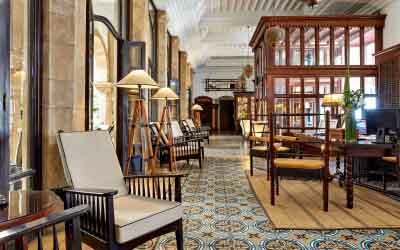 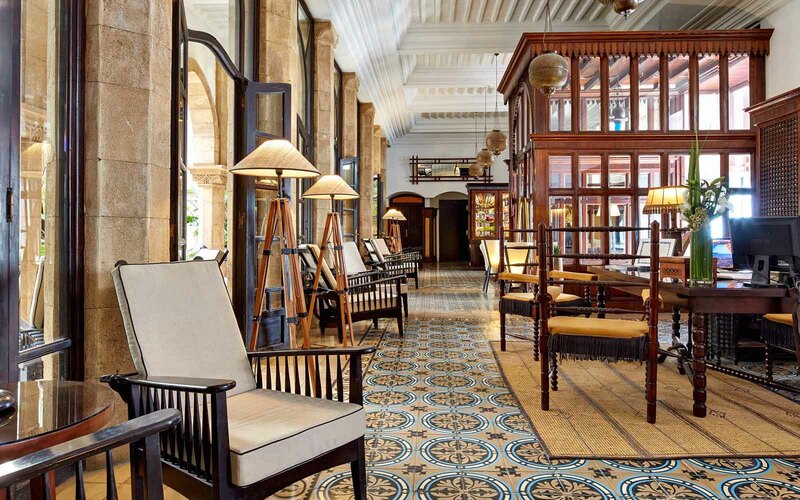 The 33 rooms and suites are furnished with modern comforts and attention to detail, reflecting the region’s rich heritage of African, Oriental and Colonial influences, and combining splendid colours with cultural design elements. 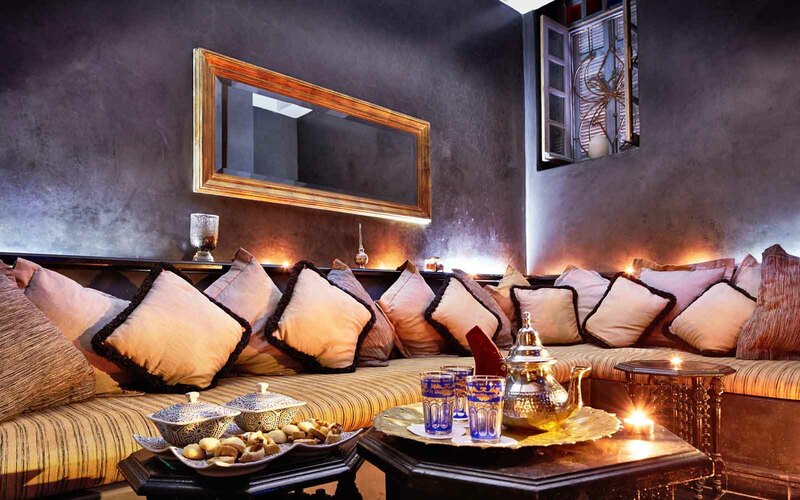 The result immerses guests in a distinctive Arabian atmosphere. 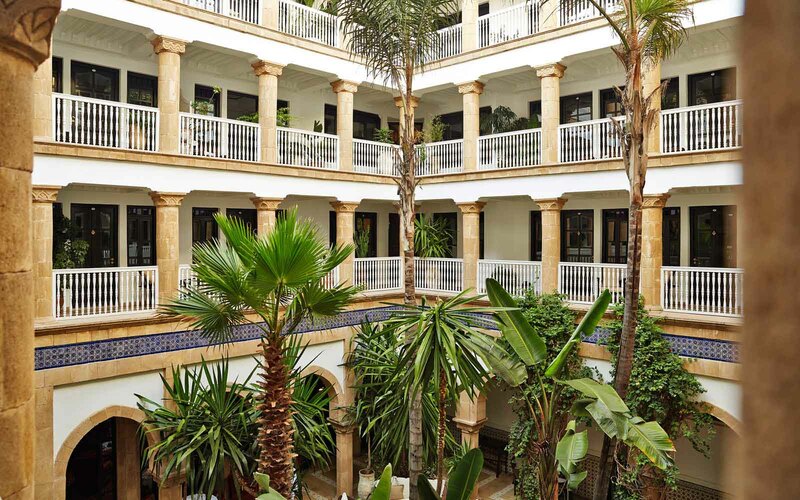 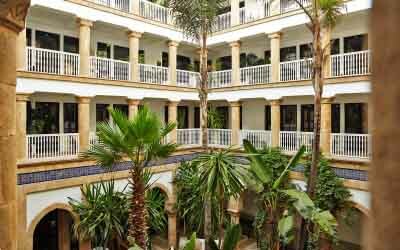 All rooms and suites overlook the serene palm shaded central courtyard. All rooms include plush bathrobes and slippers, exclusive bathroom products by Les Sens de Marrakech, high speed internet, CD & DVD player, safe, telephone and air conditioning. Foodies are delighted by the cuisine on offer at Heure Bleue Palais. Chef Ahmed Handour and his team present Moroccan culinary treasures in all their facets and with a masterful, creative blend of tradition and modernity. 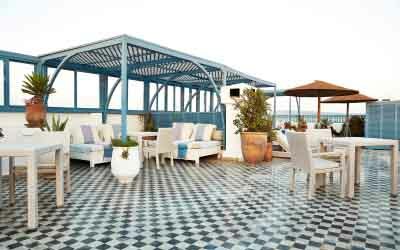 The fresh produce for Heure Bleue’s kitchens comes directly from the region: fish and seafood delivered from the port; organic vegetables, poultry, meat, goats’ cheese and figs come from the Meskala farms, just 30km from Essaouira. 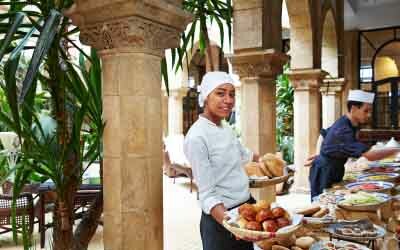 Mediterranean and French influences mingle with the style of Moroccan cuisine, retaining much of its Arab character. 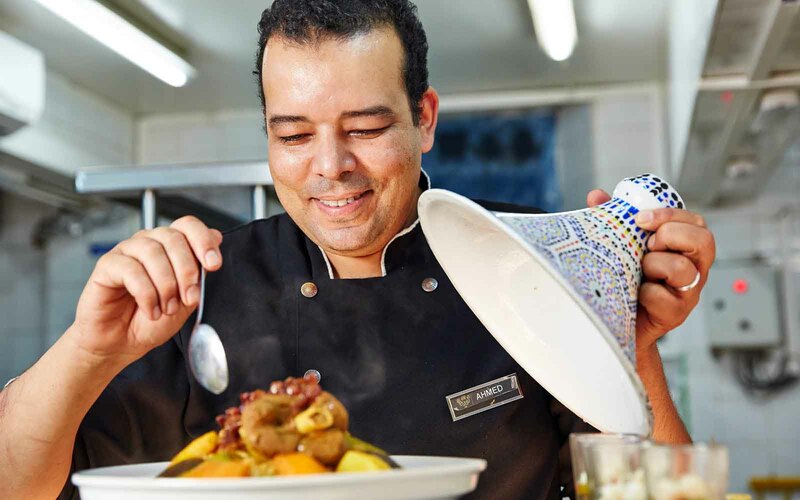 The refined taste compositions by Chef Ahmed with their infinite richness of aroma and flavour are a showcase of the best of Morocco. 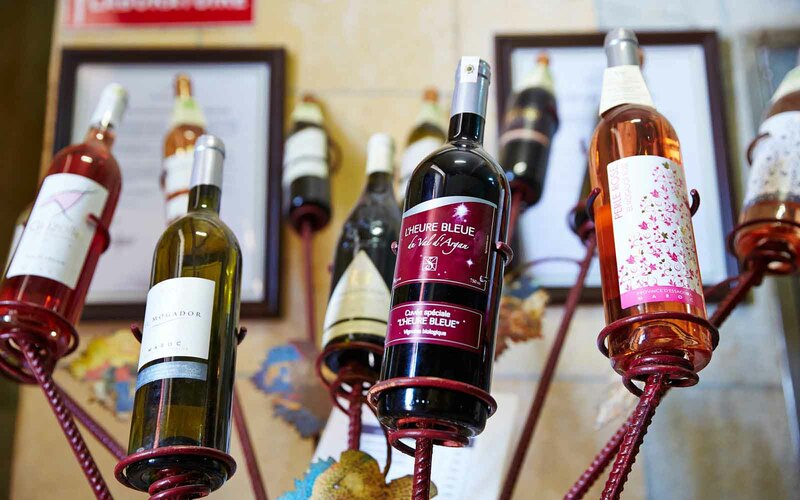 Heure Bleue Val d’Argan is the exclusive wine label of Heure Bleue Palais and can be enjoyed in the restaurants and purchased from the hotel boutique. 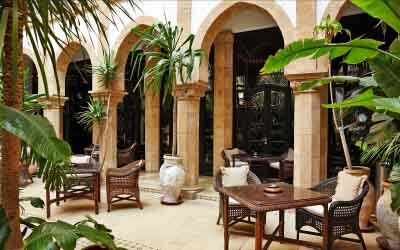 The Val d’Argan Estate is just a few kilometres from Heure Bleue Palais. 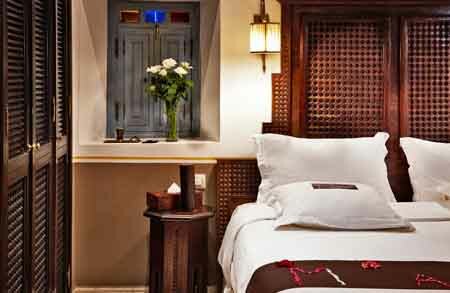 The spa at Heure Bleue Palais offers a variety of treatments from facials to scrubs and body wraps. 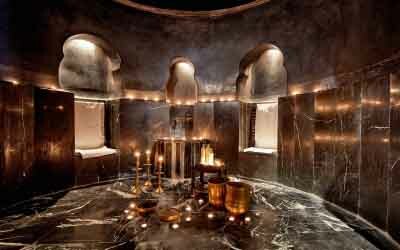 A must for every visitor is the special bathing ritual, the Hammam. 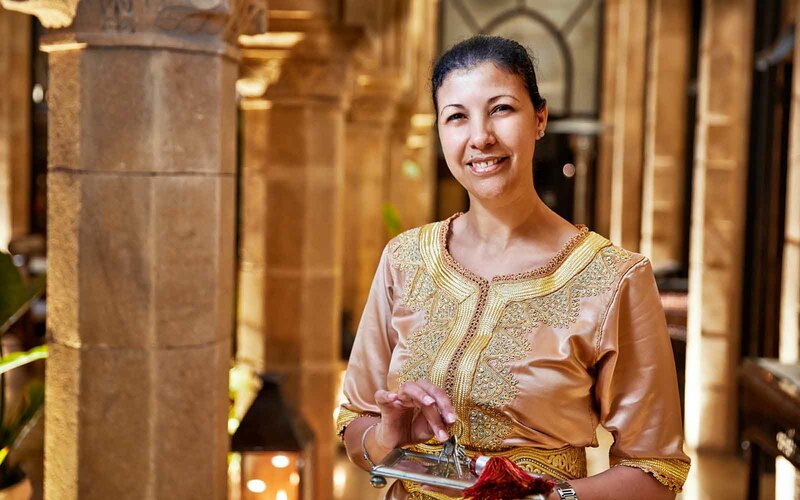 Soothing vapours and hot water showers regenerate the skin, relaxing body and mind whilst senses are stimulated with the scents of the Orient. 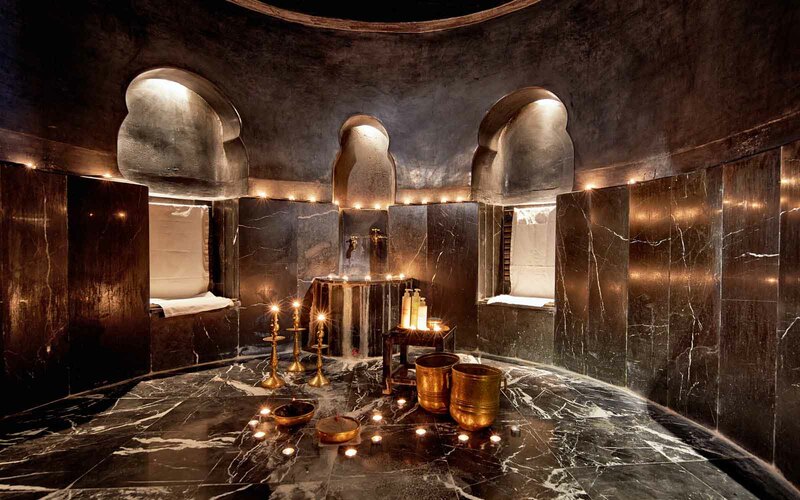 The careful peeling on the warm marble stone is followed by cleansing, a relaxing massage and a refreshing tea infusion in the Petit Spa’s comfortable relax area. 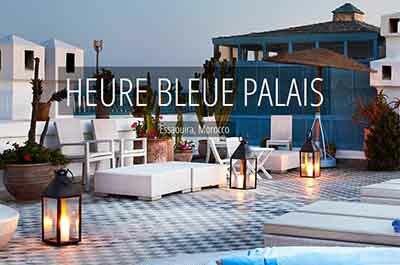 All treatments at Heure Bleue Palais are based on a range of 100% natural products developed in collaboration with Les Sens de Marrakech, made in Morocco and derived from organic ingredients such as Argan oil. 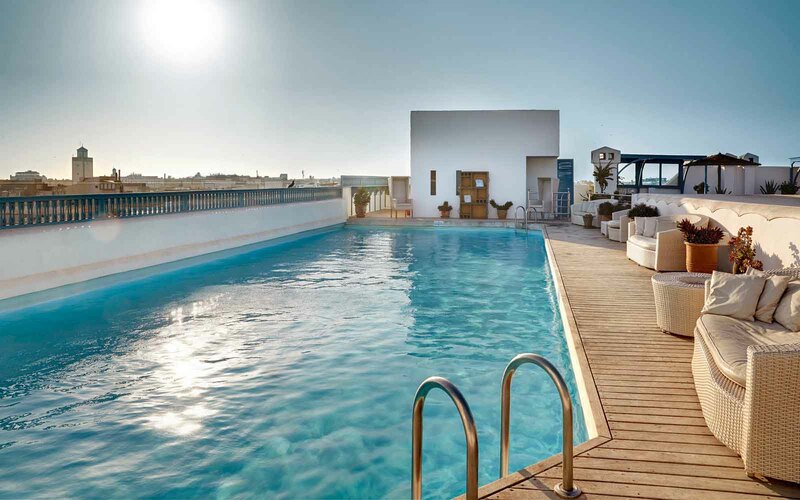 The heated pool is located on the rooftop terrace of the hotel. 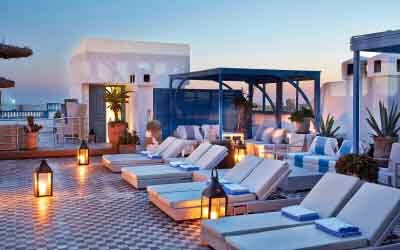 From here you can enjoy unparalleled vistas over the Medina and harbour towards the Atlantic. 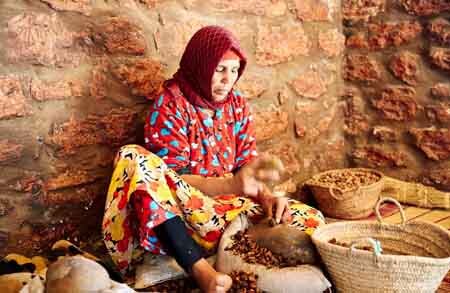 The world’s best Argan oil is produced in the Essaouira region and local Berber people have used it for centuries in food preparation, cosmetics and medicine. 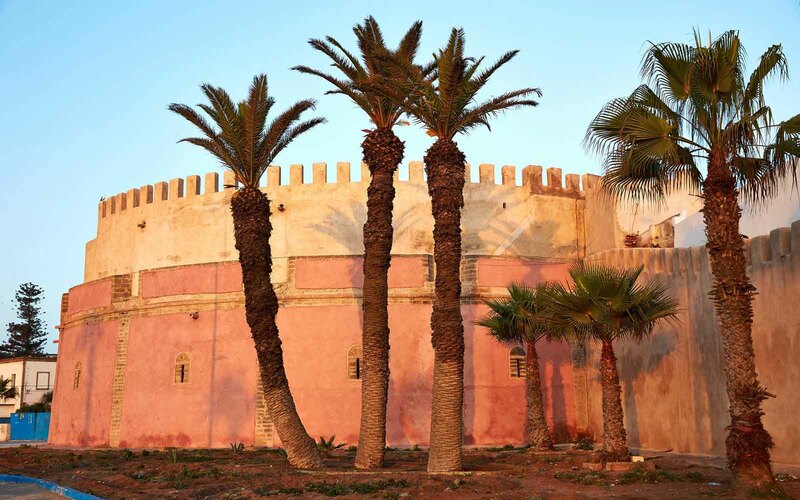 While at Heure Bleue Palais an excursion to an Argan oil cooperative is a must! 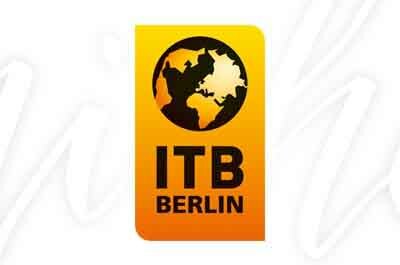 Meet with us at ITB Berlin from 7-11 March 2018! 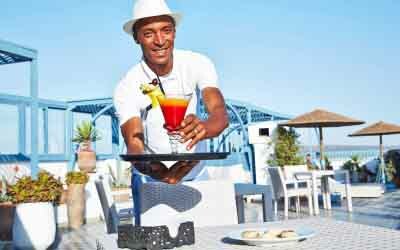 niche destinations represents authentic hospitality in Austria, Europe & beyond. 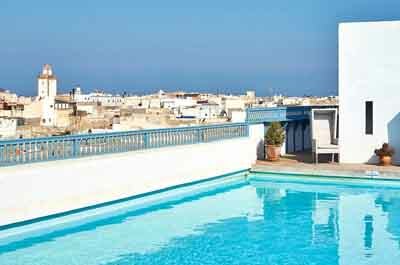 Essaouira is located on the Moroccan Atlantic coast, about 2 hours west from Marrakesh by car.